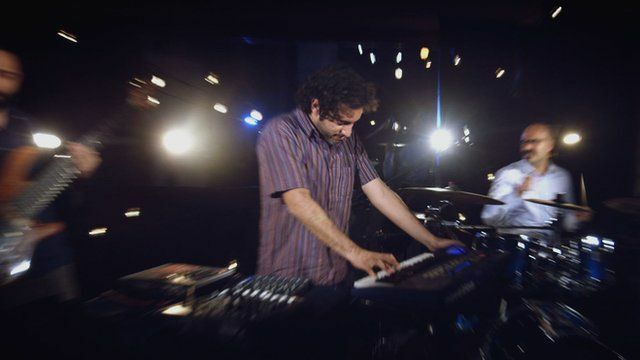 Middle East Beats: Maurice Louca Jump to media player Electronic wizard Maurice Louca is a star of Egypt's underground music scene. Ester Rada: Israel's Ethiopian diva Jump to media player Israel's Ester Rada thrills with rich music inspired by Ethiopian jazz. Middle East Beats: Amani Yahya Jump to media player Amani Yahya, is a Yemeni rapper from Al Hodaida who is now based in Sana'a, the capital city torn by conflict. Middle East Beats: Yousra El Gendy Jump to media player Yousra El Gendy is far from being the typical glamorous Egyptian singer musing about Prince Charming and performing the occasional belly dance. Maurice Louca is an Egyptian composer and musician based in Cairo. He is part of a thriving underground scene that has flourished in the wake of the Arab Spring. His electronic music is influenced by everything from psychedelic rock to Shaabi, Egypt's popular wedding music. For Middle East Beats he performs Al Mashoub, which means The Idiot, a track from his album Salute the Parrot, released in November 2014.